When a scent evokes a memory it’s distinct, but when it has the power to transport you, it’s Spadaro…Rich in oils, niche and rare. Visionary, alchemist and fragrance designer Kim Spadaro combined her strong passion for design, aromatherapy, travel and music to formulate a range of scents that are deeply personal yet inspirational to others. Each fragrance is inspired by a different destination and brings to life a moment in time experienced during Kim’s journeys. By carrying out her vision to develop Spadaro Fragrances, she is able to bottle up her own memories drop by drop into exotic and sensual perfumes as a way to keep the experience alive. From dancing with torch-bearing Majorcan fire dancers to yachting the Mediterranean to speeding through the streets of Casablanca and wandering the villages of Marrakech, jet setter Kim Spadaro created exotic and sensual perfumes and lifestyle products inspired by her travels. 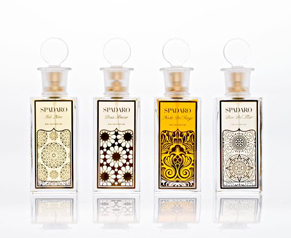 In just a few years, Spadaro Luxury Fragrances has become an internationally recognized perfume company known for scents and authentic stories that transport all who experience them to faraway places. Her fragrances have been hailed as captivating… spicy… irresistible and exotic… like a fire dance… sultry… a rare blend, words that could also describe Spadaro herself. Leaving an indelible mark on the international fragrance world, Kim Spadaro will continue to create fantasy from reality, capturing moments in time, never denying a stranger her glowing smile and exuberance for life. WHEN A SCENT EVOKES A MEMORY, ITS DISTINCT, BUT WHEN IT HAS THE POWER TO TRANSPORT YOU, ITS SPADARO.